AUCTION DATE: TUESDAY, JANUARY 14, 2014 – STARTING @ 11:00 A.M.
1993 FEMCO-25E DURGA CNC LATHE, 8’’ CHUCK, FANUC OT CONTROL, TAIL STOCK, CHIP CONVEYOR, 12 POSITION DURGA TURRET, S/N 3606. 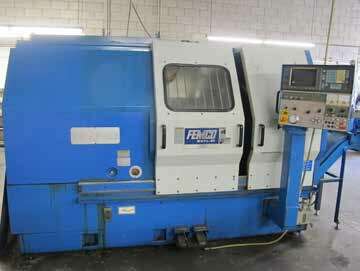 1996 FEMCO WNCL-20C/60 CNC LATHE, 10’’ CHUCK, FANUC OT CONTROL, TAIL STOCK, CHIP CONVEYOR, 12 POSITION TURRET, S/N L26023. 2) 1991 HAAS VF-1 CNC VMC, CT-40, 16 ATC, S/N 1158, 1217. SUPERMAX LG-1643, 16 X 43 ENGINE LATHE. LAGUN FTV-2S VERTICAL MILL WITH DRO AND P.F. KENT SGS-618, 6 X 18 SURFACE GRINDER, S/N 711002. .HORIZONAL BAND SAW.BALDOR DIAMOND WHEEL GRINDER. CUTTING TOOLS, END MILLS, ETC. CALIPERS, INSPECTION BLOCK, PIN GAGES AND ETC.